A worthwhile experience. Ride the ferry to Africa. Experience a tase of Berber and Moorish culture, ride a camel and shop for a rug or other souvenirs. Trip was fun and the food with cultural experience were good. However we were totally profiled and my wife left with a "Moroccan, " of questionable petagree (possibly made in China) rug. Yes, some of the vendors are "agressive" ( I had one following me onto the bus. Thats part of the "excitement." Still a fun experience and at least we have some interesting stories to tell. We can't say enough about the tour guide and his knowledge of Morocco. The tour was very well organized. Very prompt arrival and departure times. Well worth it. If I could give a negative star I would. 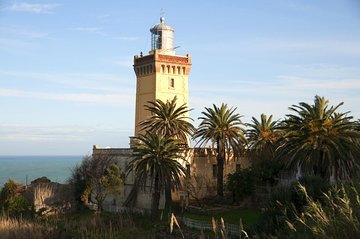 Julia Tours runs this particular tour to Tangier from various pick ups along the Costa Del Sol from Malaga to Tarifa. Where do I begin. The pick up was fine as the bus was also. It all started to unravel once we got to the ferry in Tarifa which is the departure point. We had been given a customs form to fill out for the Moroccan customs officers on board the ferry. As the ferry departed with 500 travelers, it was literally chaos! there were huge lines so you can turn in your customs forms to Moroccan officials. Our tour guide was a joke, he didn't bother to tell his group that we needed to get in line and get our form stamped. We had to ask and it was then that another tour guide told us what we had to do. I was expecting to enjoy the 1 hour ferry ride through the Gibraltar straight, but instead I was stuck in line for the duration of the trip plus an additional 30 minutes. Did I mention that they had 2 Moroccan officials for 500 travelers? Very disorganized, very hot, AC not working, truly a nightmare!!! Once we reached Tangier we were taken to another tour bus and proceeded with the tour on Tangier which was very disappointing to say the least. They took us to the Hercules Cave and we were rushed through it. I needed to use the restroom and when I entered I was approached by a woman demanding I pay her money to use the restroom, basically they are panhandling and will try to intimidate you into giving them money, which of course, I refused to do and told her to back off. After a few other pointless stops, we were going to have lunch which was included, and then after that my favorite part which was shopping in the old town. We were taken to a restaurant that of course charged extra for drinks. The food was horrible, the service was horrible, and they had a trio that played 2 songs within a 1 hour period and of course went around with their basket demanding a tip, as did the waiters! We left the restaurant and on our way to the shopping, well, what they did is the tour guide took you to one particular store which obviously gives him a kickback/cut for taking the tour group there. The place was a joke! they usher you to the 3rd floor where they give you a presentation of Persian carpets and they assign you a sales man that is really aggressive and is insisting you buy a carpet, or any of there other items at a cost 3 times higher that the regular vendors right outside. Once you are done there, the tour guide rushes you to the next stop which is an apothechary type place where once again another presentation by a bunch of idiots wearing lab coats attempting to fool you into thinking they are some some of medical professional which clearly they were not. These bozo's try sell you argan oil and other useless stuff. By the time you are done with that they tell you there is no time to go shopping anywhere else and rush you back to the bus and back to the ferry which really really ticked me off. The original itinerary was from 7am to 7pm, we got dropped off at our hotel at 10:30 pm which is ridiculous! This tour is horrible, wouldn't recommend it to anyone. I paid over 500 dollars for 5 people and honestly didn't get a thing from it. Tangier is very dirty, not much to see, architecturally and historically disappointing, vendors harass you to the point of becoming aggressive. 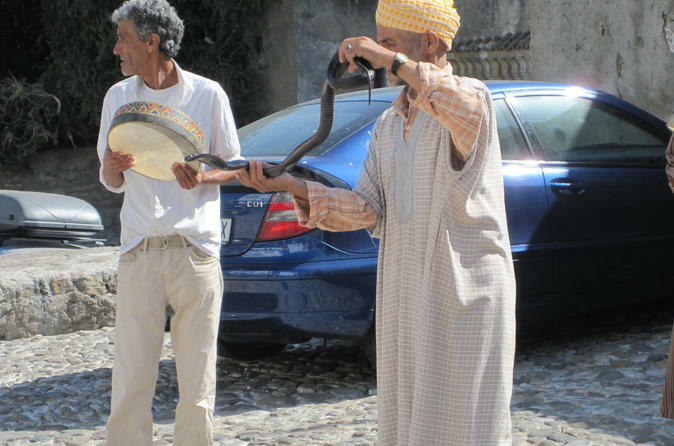 If you are set on going to Tangier I strongly recommend a private tour. This trip was quite disapponting for me. The whole day was rushed through, I felt we were treated like kids on a school trip and in total it left a sense of just getting the most money out of you. There was no free time in Tangier no time for photos either, which was not made clear when booking the trip. We were taken to see the camels but I didn't even have time to take pictures because the guide came to rush me back to the bus. The meal was average - I have had much better Moroccan food before. Then we were taken to carpet sellers and pharmacists to buy special products from them - somehow there was a lot of time arranged for their selling speeches. This time could have been better used with a more leisurely pace wondering around the beautifully looking narrow streets. I acknowledge that it was a rainy day and the bazaars were told to be closed because it was Friday but we could have been warned about this if the bazaars are always closed on Fridays. If you want to experience the real Morocco, I would suggest not to go on an organised day trip but arrange your own trip. We loved our day in Morocco!! Paco, our guide explained how to bargain with the sellers, which was very helpful, and taught us how to have a lot of fun with the process. The buses were new and comfortable, the ferry ride was enjoyable, the bus in Morocco showed the beautiful coastline area. The meal was great and included music with smiling entertaining musicians. We were taken to an artisan coop where they had many quality items, including carpets. We then went to a medicinal herbalist who explained about herb remedies which was interesting but also, entertaining. A really packed day, would have liked maybe an hour more in the bazaar area but all in all a truely fun day! Don't miss it. The tour guides were excellent. My only disappointment was the shopping. My expectation was time to shop in the marketplace and I was looking forward to returning to several stalls I noticed as we walked by on the way to lunch. Instead, our tour guide took us to two pre-selected stores where we watched a demonstration and were given an allotted time to shop in that store. Next time, I want the time to shop on my own for what I am interested in. We definitely recommend this tour!! Especially if you get FRANK MARQUEZ!!! He’s so funny, Very educational and has a wonderful personality! He also dropped us off at our resort. Great culture. Amazing food. And great price for what you get! 10 stars!!! Hopes we're high for this trip, but quickly dashed. We were ushered to stores that only guides had connections with. We had no time to shop on our own, so literally no shopping. Was unable to get gifts I had wanted. Completely disappointed in this trip. Great tour, but an awfully long day with most of the time spent getting to and from Tangiers. Enjoyed the city, but would have liked more time in the marketplace.